Join the discussion on our forums! 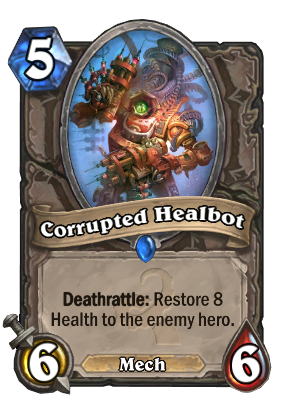 Come discuss Corrupted Healbot over in our dedicated Corrupted Healbot discussion topic. Deathrattle: Restore 8 Health to the enemy hero. Not so much "corrupted" as "has terrible aim". nobody else noticed the similarity between this card and the cover of "massive killing capacity" album from death metal band "dismember"? I'd play it for the deathrattle - not the deathrattle effect. If N'Zoth brings back the 6/6 body, it's strong by itself. Yes, it does restore 16 eventually (32 if you run 2 and play both), but you could argue that N'Zoth decks are pretty slow anyway. If it was a 6/7 for 5 would it be widely played? I like it. Beats all other 5 mana minions, also trolls sylvanas. the 8 heal doesn't concern control decks that are gonna put this in. Zombie Chow is 2 mana worth of stats, but gets a 1 mana discount for the Flash Heal for your opponent. This is 5.5 mana worth of stats with a 0.5 mana discount for a Healing Touch for your opponent. Seems pretty good.... not. I can't think of a single situation (outside of Mech synergy) where I wouldn't rather have Pit Fighter. At least the golden animation is pretty sweet. Throw in a Velen play first and you've got yourself a 32 damage OTK. no, velen would double the lightbomb damage, hence hitting your 3/5 auchenai for 6, so it'd end up triggering the healbot deathrattle as a heal, on top of that i'd destroy your velen. I feel like +1/+1 is not worth restoring 8 to the enemy hero (unless of course you have some combo or synergy). Don't think this card will be very good. Yeah, I find it hard to imagine this card seeing play outside Priest decks going for the Auchenai synergy. Even for uber lategame decks (fatigue, mill, etc.) that can reliably say they won't care about healing their opponent's face around turn 5-6, this body just isn't big enough for the cost to warrant playing around the downside. It's a mere +1/+0 over Pit Fighter (a card nobody is surprised to see in 0 competitive constructed decks). I dunno about god tier. Good tier, sure, but it's not a pick to get super excited about. It's a marginally bigger Pit Fighter with a serious drawback. Arena's all about board control, so the downside is tolerable, but it will still cost you games every now and then. I would pick any of the current good 5-drops in Arena over this without a second thought. Oh yeah, forgot to put "...in constructed", sorry. I don't play like much Arena so when I see a new card I think straight on the Constructed possibilities. Which in this case, I think its hard to others non-Priest classes pick this card as 5 drop, since there are other better options for the spot, and Priests mainly going to try combo it with Auchenai Soulpriest. One more mech to standart !